Movies have been around just about as long as the motorcar, so it’s only natural that there would end up being a lot of cars in a lot of movies! We at Jalopnik love arguing about cars, and we love arguing about movies. So, we figured it’s about time we started arguing about cars in movies. Welcome to Jalopnik Movie Club, where we take a look at cars in movies and movies about cars, and you write in with all of your hot takes. Here’s how it works: we tell you what movie we’re gonna watch. You should watch it too. Then later we’ll publish a review of that movie, and you can talk about what you thought of it in the comments. It’s like a book club, if any of you read books. At the end of every review, we’ll announce the next week’s movie, which should give us all plenty of time to watch it. I’ll do my best to let you know if the movie is streaming anywhere, but we’re not really going to worry about that too much. You all are a fairly resourceful bunch. Most of all, we want to hear from you! You can email your flaming hot movie car take to me, justin at jalopnik dot com, in the week leading up to the review being published, or just put them in the comments. You can and should also suggest a movie for us to watch. Anything is fair game—the movie itself, the cars in the movie, and even the issue of whether or not the movie should even be considered a car movie! That’s pretty much it! We’re excited to start watching movies and calling it work! There may be potential down the road for some movie-themed events if everything works out. 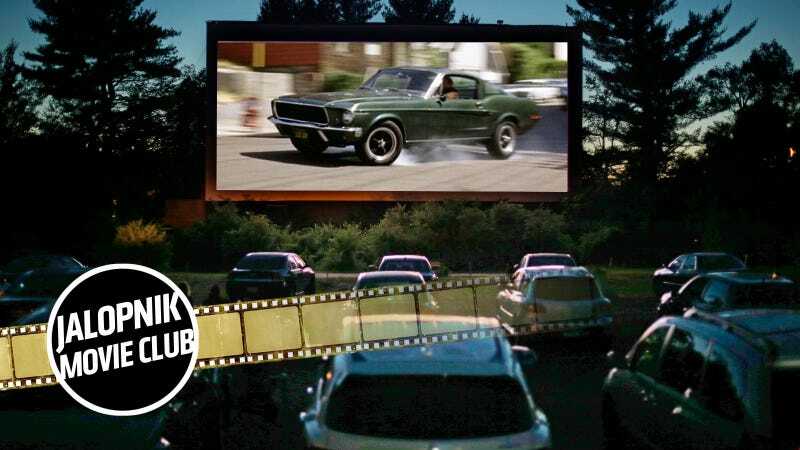 Without further ado, our first Jalopnik movie club review with be 1968's Bullitt, starring Steve McQueen. A lot of people like this movie, and a lot of people think it’s overrated. Since I’m imagining we may get a lot of requests for this movie, let’s just get it out of the way. I look forward to receiving your hot takes before Wednesday of next week (that’s Feb. 21), when the review goes live! Make sure you have fun with it. See you then!